Mesotherapy is a non surgical medical technique that can help reverse hair loss and preserve existing hair follicles. It is commonly used in France and South America as a remedy to many cosmetic complaints. It is suitable for both men and women who suffer from hair thinning, alopecia or male pattern baldness. Nu Hair Clinics offer mesotherapy at various locations across the UK including London, Liverpool, Leeds, Manchester and Nottingham. A major concern nowadays of men and women regardless of age is hair loss, hair thinning or baldness, while earlier this was only a problem associated with old age; with increased changes in lifestyle, mental and physical stress, hair loss has become a common phenomenon among men and women. You need not feel sad or lower your confidence, as hair loss is not the end of the world, with Nu Hair Clinic’s advanced Mesotherapy hair loss treatment; hair growth is now possible and relatively easy. The procedure involves very small injections of a combination of vitamins, minerals and DHT blockers (the lack of this compound is thought to be the cause of most people’s hair loss). The injections stimulate blood circulation to the hair follicles, which helps to promote new hair growth and sustain existing follicles. Non-scarring hair loss is a type of baldness where scalp appears normal but contains lot of empty hair follicles. Scarring hair loss is another type where follicles are destroyed forever. In these conditions, baldness occurs either in a localized area, small area, large area or the entire scalp. Most clients find that they require five or six treatments over a six month period before results are visible, however individual results vary and you may find you need more or less treatments to attain your desired result. Hair loss or baldness is different for each individual, while some may experience hair loss due to genetical disorders others are affected by the population they are born into as well as physical destruction and loss of hair follicles. Hair loss can also happen due to chemical treatment and frequent physical damage done to your hair, hormonal imbalance, infections or medical conditions can be a cause. Hair loss in men can be caused due to factors like genetic, hormonal, stress, medications, poor nourishment etc. The most common type of baldness observed is mid frontal baldness or receding hairline on the forehead, single quarter sized circle or hair loss on the crown or vertex and finally entire scalp goes bald or complete hair loss. Hair loss in women can be pretty disturbing and many a times the causes are poor nutrition,stress, iron deficiency, hormonal imbalance, surgery, medications, genetics etc. Baldness in women often starts with hair thinning on the crown part of the head and eventually leads to hair loss completely on the crown. To know if Mesotherapy will suit your hair loss issue, you need to consult with our expert doctors at the Nu Hair Clinic. After looking at your present situation, our doctors will explain to you the problem, the solution and if Mesotherapy will work for you or not. You are at your own free will to make a decision that will give you long lasting good hair days. The procedure involved in Mesotherapy treatment includes injecting the patient with combination of vitamins, minerals and DHT blockers. A lack, in the hormone Dihydrotestosterone (DHT) is the main reason behind hair thinning and hair loss. The injection once applied will stimulate blood circulation to the hair follicles and encourage new hair growth and also sustain the existing hair follicles. Opting for Mesotherapy in management of hair loss is the perfect remedy for your persisting baldness issue. What could be the risk? Mesotherapy can be a little painful but it is assured to be successful, some patients opt for five or six treatments over a period of six months to notice visible results, but it can always vary upon different individuals. Just like the treatment, aftercare is also important which predicts the durability and lifetime of your hair growth. A proper diet and medications prescribed by our surgeons can help give you thick, lustrous and shining hair. The team of surgeons and doctors at Nu Hair Clinic offers only the best to our patients. Any patients who approach us with a problem of hair loss are initially diagnosed to find out the root cause of the problem and then after thorough inspection and investigation, our doctors will offer you the best possible remedy or solution. All doctors are experienced, educated and renowned in the field of Mesotherapy and hair loss treatment. We have a lot of satisfied customers who are happy and moving on with their life without worrying about hair loss. 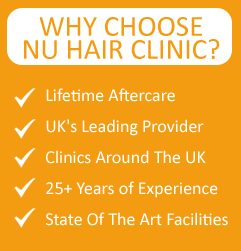 Nu Hair Clinic prides itself on being the best group of hair loss clinics with locations in Leeds, Liverpool, London, Manchester, Newcastle, Nottingham and Sheffield. We offer a full range of hair loss treatments across the UK, depending on your individual needs and preferences. We offer the best hair loss surgeries and best non surgical hair loss treatments in the UK. Nu Hair Clinic offers the best hair loss treatments at our clinics in Leeds, Liverpool, London, Manchester, Newcastle, Nottingham and Sheffield. Visit our clinics page for more information.